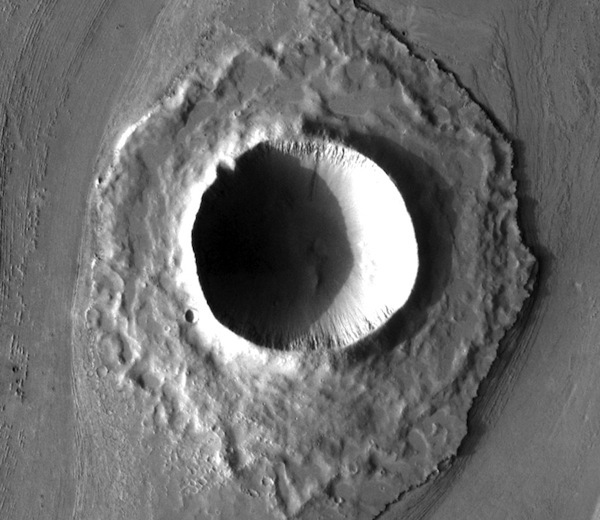 Let's start with a simple crater, one that's less than about 8 kilometers (5 miles) wide. When fresh, these have bowl-shaped profiles with low, raised rims. Around them may be a rumpled blanket of debris, also known as ejecta, tossed out by the force of impact. A simple crater is born in the impact of a solid object — rocky, stony-iron, or icy. The object may have been orbiting the Sun for billions of years, but finally its path intersects with Mars. The impactor streaks through the thin atmosphere and slams into the surface at speeds of 2 kilometers (1 mile) per second or more. Making a crater follows four basic stages: contact, compression, excavation, and finally modification. Let's follow what happens in each stage. After contacting the surface, the impactor's momentum carries it a short distance into the ground, a bit less than the body's diameter. The impact sends shock waves into the ground and backward through the impactor, compressing both. The shock waves cause the rocky materials to flow like toothpaste. They also heat them to melting — or vaporize them. Part of the impactor shoots back out as a jet of super-hot gas. Next comes excavation. The shock waves expand violently in every direction, which is why all but nearly horizontal impacts make circular craters. In the ground, the shock waves push down, then outward, then up. This enlarges the cavity into a bowl, throwing liquid rock, fragments, and larger rocks from the newborn crater. The shock also lifts target rock layers and flips them over on themselves, making the crater's upraised rim. In the last stage, modification, broken rock inside the bowl slides down to the bottom, piling up as a kind of shattered rubble that scientists call breccia. This action also widens the rim by about 10 percent. Mixed with bits of impact-melted rock, the breccia fills the original cavity about half full. The end result is a crater roughly five times wider than it is deep. The whole show is over in about 10 seconds.